The Keyboard Cover is reversible with silver side/black side. 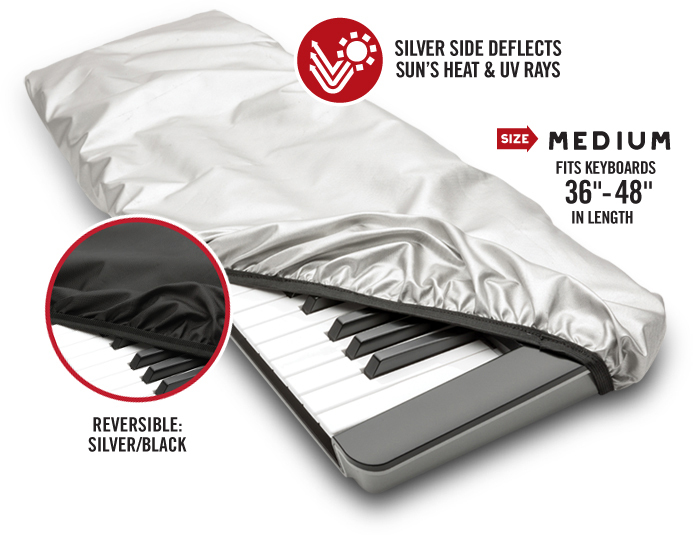 Use with the silver side out when you need to protect your keyboard from the sun’s heat and UV rays. Use with the black side out when you need to protect your keyboard and obscure it from the view of the audience. The elasticized fit allows the cover to be used on keyboards ranging in length from 36” – 48”. To customize the cover even further there is a strap attached to secure from the underneath side along with 6 pieces of hook and loop. The Keyboard Cover is also water repellant. Copyright 2018, Maloney StageGear Covers.